If text is set ragged right, the word space (the space between words) can be fixed and unchanging. If the text is justified (set flush left and right), the word space must be elastic. In either case the size of the ideal word space varies from one circumstance to another, depending on factors such as letterfit, type color, and size. A loosely fitted or bold face will need a larger interval between the words. At larger sizes, when letterfit is tightened, the spacing of words can be tightened as well. 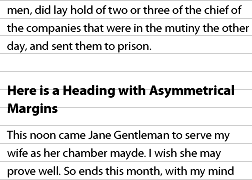 In the preceding example, word space in paragraphs is increased by 0.25 em (effectively doubling it) and the word space in top level headings is decreased by 0.125 em (effectively halving it). While in theory you could specify word-spacing in pixels or any other allowable unit of length, it is important to specify word-spacing in ems as that is the only way to guarantee the word space changes proportionately to the text size (when readers change their default text size, for example). The em is a sliding measure. One em is a distance equal to the type size. In 6 point type, an em is 6 points; in 12 point type an em is 12 points and in 60 point type an em is 60 points. Thus a one em space is proportionately the same in any size. Note that both boxes have a height and width of 1 em but because they have different font sizes, one box is bigger than the other. Box 1 has a font-size of 22 px so its width and height is also 22 px; similarly the text of box 2 is set to 55 px and so its width and height are also 55 px. When typographers set the measure and text size for printed media, those dimensions are fixed and unchangeable in their physical manifestation. In this regard, the Web as viewed on-screen is fundamentally different to print because the medium is far more under the control of your readers. In particular, if your reader wishes to change the text size or the dimensions of the ‘page’, he can do. In the preceding example, column 1 has a fixed width: it has been set to 400 px wide. With text rendering at 12 px this would result in a measure of approximately 66 characters per line. If your reader increases the text size to 16 px then the measure reduces to 50 characters per line. Thus when the text size is changed, so the measure changes. Column 2 has a liquid width: it has been set to 50% wide. Assuming your reader is browsing with a window 1000 px wide, the box would be rendered as 500 px wide, resulting in a measure of about 83 characters per line. A measure of 83 may be a little too wide for your reader, but because the box is liquid, your reader could reduce their window size to 800 px, thus narrowing the box to 400 px and creating a more comfortable measure of 66 characters per line. Column 3 has an elastic width: it has been set to 33 em wide. On average one character takes up 0.5 em so this box will have a measure of 66 characters per line. If your reader increases the text size, the width of box will increase accordingly and so the measure remains at 66 regardless of the text size. From a typographical perspective, the most appropriate method is to set box width in ems (elastic layout) as it ensures the measure is always set to the typographer’s specification. Setting box width as a percentage (liquid layout) gives the typographer approximate control over measure but also allows the reader to adjust the layout to suit his or her comfort. Relinquishing such control makes some designers quake in their boots, but the beauty and advantage of the Web as a medium is that readers are able to adjust their reading environment to suit their own needs. This is a concept that should be acknowledged & embraced, and built into website designs from the ground up. In justified text, there is always a trade-off between evenness of word spacing and frequency of hyphenation. Narrow measures – which prevent good justification – are commonly used when the text is set in multiple columns. Setting ragged right under these conditions will lighten the page and decrease its stiffness. Many unserifed faces look best when set ragged no matter what the length of the measure. And mono-spaced fonts, which are common on typewriters, always look better set ragged. Effective justification of text can only be achieved if long words are hyphenated. HTML and CSS 2 do not have any provision for automatic hyphenation and current Web browsers support, even for manual hyphenation, is poor. CSS3 provides further refinement of justification within the Text Module. For European languages, the text-justify property provides two justification options: inter-word and inter-character. Setting inter-word selects the simplest and fastest full justification behaviour, which spreads the text evenly across the line by increasing the width of the space between words only. No expansion or compression occurs within the words, i.e. no additional letter spacing is created. CSS3 also provides last line alignment with the text-align-last property. Normally the last line in a paragraph of justified text would not be justified, however if text-align-last is set to justify then the last line will be also spread evenly across the line, although in most cases this would be highly undesirable from a typographical perspective. A potentially more useful purpose for text-align-last, at least for display text, is to set it to size. With size selected, the line content is scaled to fit on the line, so a line with fewer characters will be displayed in a larger font. In the nineteenth century, which was a dark and inflationary age in typography and type design, many compositors were encouraged to stuff extra space between sentences. Generations of twentieth century typists were then taught to do the same, by hitting the spacebar twice after every period [full stop]. Your typing as well as your typesetting will benefit from unlearning this quaint Victorian habit. As a general rule, no more than a single space is required after a period, colon or any other mark of punctuation. Names such as W.B. Yeats and J.C.L. Prillwitz need hair spaces, thin spaces or no spaces at all after the intermediary periods [full stops]. A normal word space follows the last period in the string. Which renders as W. B. Yeats and J. C. L. Prillwitz. Unfortunately some browsers which are less Unicode-aware will show square placeholder symbols instead of the required spaces, so until support improves, no space at all is probably the way to go in this instance. Acronyms such as CIA and PLO are frequent in some texts. So are abbreviations such as CE and BCE or AD and BC. The normal value for letterspacing these sequences of small or full caps is 5% to 10% of the type size. Many typographers like to letterspace all strings of numbers as well. Spacing is essential for rapid reading of long, fundamentally meaningless strings such as serial numbers, and is helpful even for shorter strings such as phone numbers and dates. If you have created static pages for your website then inserting <acronym> and <abbr> elements where appropriate might be slightly tedious but probably feasible. Dealing with text delivered by a content management system, however, is a different kettle of fish and would need some sort of automation. At this point your CMS developer would probably turn to regular expressions. This function looks for sequences of 3 or more uppercase letters or numbers, such as CSS, HTML and W3C, and wraps an <abbr> tag around them. A man who would letterspace lower case would steal sheep, Frederic Goudy liked to say. The reason for not letterspacing lower case is that it hampers legibility. But there are some lowercase alphabets to which this principle doesn’t apply. Moderate letterspacing can make a face such as lowercase Univers bold condensed more legible rather than less. Letterspacing lower case on the Web is particularly risky as only some faces actually benefit from the treatment, and you can rarely guarantee which type face you will actually be transforming. Notice that the letter-spacing is specified in ems to ensure that the amount of kerning is applied in proportion to the text size. Kerning – altering the space between selected pairs of letters – can increase consistency of spacing in a word like Washington or Toronto, where the combinations Wa and To are kerned. At present there is no mechanism within HTML or CSS that specifically enables kerning. However text on the Web does not generally need manual kerning, as all digital fonts have kerning tables built-in. These tables define which letter pairs need adjusting and by how much, and are usually adhered to by operating systems. The only time manual kerning may prove necessary is with larger text such as that in headings, in particular when numbers, italics or punctuation are involved. It is also important to bear in mind that letter pairs in one font of your font-family list may need kerning whereas in another font they do not. In this case it is advisable not to kern, as too much kerning is almost always worse than none at all. Notice that the span was applied around the first letter of the pair, not around both letters. This is because the letter-spacing property adds or removes space after each letter. Notice also that the letter-spacing is specified in ems to ensure that the amount of kerning is applied in proportion to the text size. The CSS3 Text Module may contain the kerning-mode and kerning-pair-threshold properties to aid control over kerning, although these properties have yet to be fully defined. In the world of digital type, it is very easy for a designer or compositor with no regard for letters to squish them into cattle trains and ship them to slaughter. Lists, such as contents pages and recipes, are opportunities to build architectural structures in which space between the elements both separates and binds. The two favourite ways of destroying such an opportunity are setting great chasms of space that the eye cannot leap without help from the hand, and setting unenlightening rows of dots that force the eye to walk the width of the page like a prisoner being escorted back to its cell. While most of the CSS is straight forward, a point worth highlighting is the margin declaration for the table itself. There is a right margin of 3 em to set the table in slightly from the right gutter and a left margin of auto to push the table over towards the right hand side of the page. There a couple of points worth noting in the CSS. The table has been centered by giving the left and right margins a value of auto. For block-level elements a width declaration would also be required when applying this technique, however tables have an inherent width so one does not need to be specified explicitly. The bullet points separating chapter titles and page numbers have been generated by the CSS. Specifically a bullet point (Unicode character 2022) has been inserted before the td element. Vertical space is metered in a different way [to horizontal space]. You must choose not only the overall measure – the depth of the column or page – but also a basic rhythmical unit. This unit is the leading, which is the distance from one baseline to the next. However that example is bad as line-height should never be applied using absolute units such as points or pixels. In the prior example, when text is resized in a browser, the font-size increases (to 18 pt for example) but the line-height may remain at 15 pt. So instead of the lines being spaced apart, they would actually overlap. It should be noted that some browsers add a little leading by default: Safari and Internet Explorers for example; whereas others, such as Camino and Firefox, do not. Text on the web almost always benefits from an increase in line height, and figures upwards of 1.3 are common (this page has a line-height of 1.5 for example). Headings, subheads, block quotations, footnotes, illustrations, captions and other intrusions into the text create syncopations and variations against the base rhythm of regularly leaded lines. These variations can and should add life to the page, but the main text should also return after each variation precisely on beat and in phase. The most common addition of vertical space on a webpage is that inserted between paragraphs. If the rhythm of the page is to be maintained, the spacing of paragraphs should be related to the basic leading. For example, the text on this page is set at 22 px with a line-height of 1.5 em, making each line 33 px in height. In order to keep the rhythm of the text, the vertical spacing between blocks should also be 33 px. This is achieved by setting top- and bottom-margins equal to the line height. When there is a change in text size, perhaps with a heading or sidenotes, the differing text should take up a multiple of the basic leading. As stated earlier, each line on this page is 33 px in height. This means that every diversion from the basic text size should take up multiples of 33 px. This can be accomplished by adjusting the line-height and margin accordingly. The subheadings on this page are set to 27.5 px. In order that the height of each line is 33 px, the line-height should be set to 33 ÷ 27.5 = 1.2. Similarly the margins above and below the heading must be adjusted. The temptation is to set heading margins to a simple 1 em, or leave them at the browser default, but this would usually result in breaking the rhythm of the text. In the case of this page, the top and bottom margins are the same size and equal to a full line, so they too should be set at 1.2 em. Diagram of text showing how the basic leading is retained with a heading and asymmetrical margins. The main body text again has a text size of 22 px and a line height of 33 px. The sidenotes are set at 18.33 px and so their line-height must be increased to 33 ÷ 18.33 = 1.8. On the Web, images in sidebars and within the main body of text are almost always guilty of disrupting the rhythm of text. The same rules should be applied to images as to headings: any image and associated caption should take up multiples of the basic line height. Ornaments […] drop lines […] outdented paragraphs […] and others, have their uses but the plainest, most unmistakable yet unobtrusive way of marking paragraphs is the simple indent. There is no limit to how much you indent by, but you may wish to start by describing a square. This can be achieved by setting your indent to the same value as your line-height. Indentation is not the only way to indicate a paragraph. The many alternatives include: simple block paragraphs, outdenting, ornamented indents, ornamentation within a continuous stream, or droplines. As stated earlier, block paragraphs – paragraphs separated by line breaks – are the default method used by web browsers. As explained in §2.2.2 the margins separating paragraphs should be set equal to the line-height in order that the rhythm of the text is maintained. Marking paragraphs by outdenting them into the margin is achieved in the same manner as indenting: simply use a negative number for the indent. In the above example, applying a text-indent to the paragraph would cause the ornament to be indented with the first line of the paragraph; to separate the ornament from the content, padding-right has been applied to the generated content. However the block quotations are set, there must be a visual distinction between main text and quotation, and again between the quotation and subsequent text. Adding a gap between a block quotation and the main text is best achieved by applying a top and bottom margin to the blockquote. By default, browsers usually apply a left and right margin as well. You may wish to remove this altogether by setting the margins to zero. If you wish to retain the indent, a more consistent layout can be achieved by applying left and right margins equal to the top and bottom margins. As explained in §2.2.2, the margins should be sized so that the rhythm of the text is maintained. Where the blockquote text size is the same as the main text, the separating margins should be set equal to the line-height. Verse is usually set flush left and ragged right, and verse quotations within prose should not be deprived of their chosen form. But to distinguish verse quotations from surrounding prose, they should be indented or centered on the longest line. When setting verse, whether on the web or otherwise, the primary concern is not to deprive it of its “chosen form”, including matters of spacing and visual structure (as this is considered, in many poetic works, to be at least as important as the words themselves). As such, a pre (pre-formatted) element is most apt to setting verse. This span can then be centered in Internet Explorer applying text-align:center to the pre and resetting the text alignment on the span element. Thinks in a marrow bone. Fi-nally is a conventionally acceptable line-end hyphenation, but final-ly is not, because it takes too little of the word ahead to the next line. Liquid layouts and resizable text mean that, on the Web, one never knows which word will be at the end of a line. To deal with this in HTML, there are two types of hyphens: the plain hyphen and the soft hyphen. Browsers treat the plain hyphen as just another character. The soft hyphen tells the browser where a word break can occur, and should only be displayed when a word is being broken across two lines. Which renders in your browser as: anti­dis­est­ab­lish­ment­arian­ism anti­dis­est­ab­lish­ment­arian­ism anti­dis­est­ab­lish­ment­arian­ism. By definition, a soft hyphen should only appear when the word is wrapped. Browser support for this was patchy, but the situation has improved recently. In English one hyphenates cab-ri-o-let but in French ca-brio-let. The conventions of the individual language should, ideally, be followed even for single foreign words or brief quotations. This guideline can be achieved on the Web when hyphenating manually. See §2.4.1 for more information on manual hyphenation. Hyphenation will be included in the CSS3 Text module, but at the time of writing, the definition of the hyphenation feature is still very much up-in-the-air. Currently the CSS3 Paged Media module has more details of the hyphenation properties originally proposed. A value of auto would indicate that the built-in dictionaries, if any, should be used. Hard spaces are useful for preventing line-breaks within phrases such as 6.2 mm, 3 in., 4 × 4, or in phrases like page 3 and chapter 5. 1&nbsp;inch is equivalent to 2.54&nbsp;cm. This function looks for sequences of a number followed by a space followed by a letter and replaces the space with a non-breaking space. This would deal with instances such as 2.54 cm. For phrases like chapter 5 it would be better to create a set of watch-words rather than attaching every number to a preceding string. Additionally rules would need to be created to handle common mathematical operators as in 4 × 4. The stub-ends left when paragraphs end on the first line of a page are called widows. They have a past but not a future, and they look foreshortened and forlorn. Comprehensive control for page breaks was introduced in CSS 2. The page-break-before and page-break-after properties enable you to say that a page break should occur before or after the specified element. The following example starts a new page everytime an h1 heading is encountered and after every .section block. In reality that is not a likely situation and would always be problematic if readers set their browsers to print out different size text, or use different size paper, to your assumptions. In essence widow and orphan control is not currently possible for the vast majority of people. However CSS 2 support will increase with time so if you are writing a print style sheet it is worth considering the properties already specified in CSS 2. In the sixteenth century, a series of common sizes developed among European typographers, and the series survived with little change and few additions for 400 years. […] Use the old familiar scale, or use new scales of your own devising, but limit yourself, at first, to a modest set of distinct and related intervals. Sizing text in CSS is achieved using the font-size property. In print, font sizes are specified absolutely, for example setting text at 12 points implies a particular physical height for the printed text. On the web, font sizes can be set absolutely or relatively, and in a number of different units. What’s more, most web browsers enable the reader to resize the text to suit their own reading environment and requirements. For text which is to be read on screen, the situation is slightly more complicated. Arguably the most appropriate unit is pixels which is a unit relative to the screen resolution. Setting text sizes in pixels gives web designers precision similar to that afforded to print designers. However, some web browsers does not allow readers to resize text set in pixels, so we need to look to other units. Sizing text using the em unit is the next most appropriate approach. The em is a true typographic unit and was recommended by the W3C from the outset of CSS. Ems are a relative unit and act as multipliers based on the text element’s parent element. Thus, if the body of a web page has 16 px text by default, making paragraphs render at 12 px would require setting paragraphs at 0.75em. More details and analysis of font sizing can be found in How to Size Text in CSS. When arabic numerals joined the roman alphabet, they too were given both lowercase and uppercase forms. Typographers call the former text figures , hanging figures , lowercase figures , or old-style figures (OSF for short) and make a point of using them whenever the surrounding text is set in lowercase letters or small caps. The alternative forms are called titling figures , ranging figures or lining figures , because they range or align with the upper case. [Text figures] are basic parts of typographic speech, and they are a sign that dollars are not really twice as important as ideas, and numbers are not afraid to consort on an equal footing with words. […] However common it may be, the use of titling figures in running text is illiterate: it spurns the truth of letters. Many core web fonts (indeed most digital fonts) ship with only one case of figures: Arial, Comic Sans, Helvetica, Tahoma, Times, Times New Roman, Trebuchet and Verdana all ship with titling figures only. Georgia is the sole holder of text figures (but lacks titling figures). Microsoft’s new ‘C’ fonts however, are very strong with respect to their numerals. All six typefaces (including the fixed-width Consolas) have both titling and text figures included in the base fonts. Further, three of the fonts default to titling figures (Calibri, Cambria, and Consolas), the other three to text figures (Candara, Constantia, and Corbel). Constantia and Corbel even include small variants of their lining figures for use with text set in small capitals. Despite the bright hope for the future brought by Microsoft’s ‘C’ fonts, CSS currently makes no provision for the control of numeral case, this means the default figures will always be used, regardless of context. The CSS3 fonts module is still a working draft, but is being actively revised. The current editor’s draft includes a proposal for supporting specification of lining or old-style numbers through the font-variant-numeric property. To specify titling figures, one would use a value of lining-nums.